Would anyone be interested in taking part in a "Golden Oldies" Top 40 ? The catch is that the era I'm looking at would be mainly the mid 50s to 1963. Is there enough of us interested in that era to make it work ? It would not be exactly nominating and voting as such. I've compiled a list of Billboard's 40 highest charting songs of the period 1955 to 1963. I chose those years because Rock & Roll is generally considered to have started in 1955, and of course 1964 saw the 'British Invasion'. I'm looking at the 'Happy Days' era, I believe. Each person would give points in 3 sections. 5 Existing songs in the Top 40 you'd like to advance: (Plus) +5, +4, +3, +2, +1. 5 Existing songs in the Top 40 you don't really care for: (Minus) -5, -4, -3, -2, -1. 5 Other Songs you'd like to see in the Top 40: (Plus) *5, +4, +3, +2, +1. These may be duplicated on a number of Lists ! If somebody mentions a song/s I really like before I make my List, I'll support them. It's definitely NOT a competition. Now this should not detract from the Top Ten. I really can't see how it would. It may even bring us more 'mature' people who look in at the Top Ten each week, but haven't plucked up the courage to participate yet. From the number of 'hits' (no pun) on the Top Ten Thread, we do have lots of 'lookers'. It won't be as difficult as I may have made it sound. Thank you dear Lea. Lovely to see you too. Count me in!!! And so glad to see you around... and playing! You know I'll play!....Hi 55...Nice to see back on the boards! Elena and Laurie - two more of my favorite ladies. Thanks for your good wishes and for 'putting your hands up'. Now we have four ! Count me in, too, Darryl! I love that era in music. Songs that make me happy (even if it's a sad song)! That makes the Famous 5 now. When I put that first Top 40 on, I'll also put some links to Charts from 1950 to 1963 - probably the "Cashbox" ones, as "Billboard" ones are hard to find because of existing Copyrights. I think most people will be surprised at just how many songs they DO know from that time. Many R&B songs come to mind (and white covers of them). Hey Darryl! So lovely to see you! Since I resemble that remark, count me in. I think I probably know enough to play. Sound like a great era of music. I'm in! I've been watching Happy Days re-runs lately, so maybe that'll help. Glad to see you again ol' double nickels!! What the heck, I'll bite. I love Motown and some older stuff, so why not. I'm in if it's allowed. Everyone is 'allowed' my friend. Thanks to all of you for agreeing to play, and of course for your welcoming words. Ol'Double Nickels ? That's a newie on me Mike. I like it. EDIT: My wife is smarter than me. I just told her and she said "isn't a nickel five cents ? Double 5". Here's a Link to a wonderful New Zealand Site which has comprehensive "Cashbox" and "Billboard" Chart placings and information for the era we're looking at, and as far back as the 1940s ! Enjoy. And I bet you find a lot of songs from 1950 to 1963 there that you know and like. 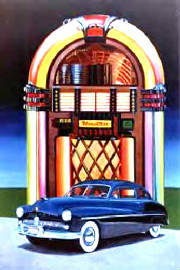 And if we can get bluesboy to play, "Good Rockin' Tonight"/ Wynonie Harris/ 1949 is fine too. VERY GOOD Laurie. I prefer "Ol' Dirty Basket" though. Or did he get shot ? In that case, 10 Cent will be fine. I'm enjoying myself. Didn't know I'd missed you all so much. I'll try to get the First Week's Chart up very soon. I have it in PDF format and I have to work out how to transfer it to here so it lines up properly. I'll pressgang Young 55 when he calls in later. Sorry - we just can't get the Chart to a readable size here, as the Forum automatically resizes it. 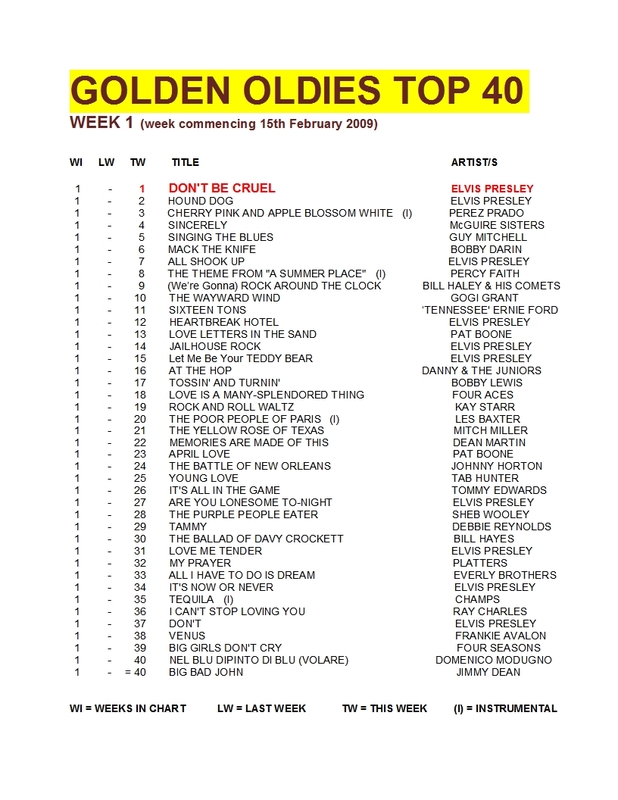 So..here's a Link to the GOLDEN OLDIES TOP 40 #1, which you can enlarge to full size. (Please tell me if there's any problems). Also, please let me know what you think of it ! It's the Top 40 U.S. Pop Singles for the period 1955 to 1963. NO Album only tracks, and NO non-charting B sides. Elvis Presley dominated with 10 songs, Pat Boone with 2, and 29 other Artists 1 each (we had a Tie for 40th place). 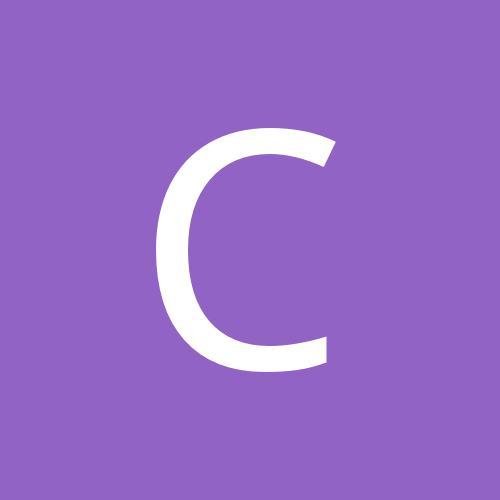 I hope you enjoy browsing through it. I'll go first with the 'voting' later to show the way. OK ?